Every year for the 4th of July I like to create a colorful patriotic dessert. This year, I thought I’d go back to the basics and show you how easy it is to create an impressive red, white and blue layer cake topped with strawberries and blueberries. For simplicity, this recipe uses two boxed cake mixes, canned frosting and food coloring. Also, rather than needing fancy pastry bags and tips for decorating, the recipe shows you how to use plastic disposable bags to pipe the icing. It’s an easy step-by-step that’ll make an impressive dessert for your Independence Day celebration. 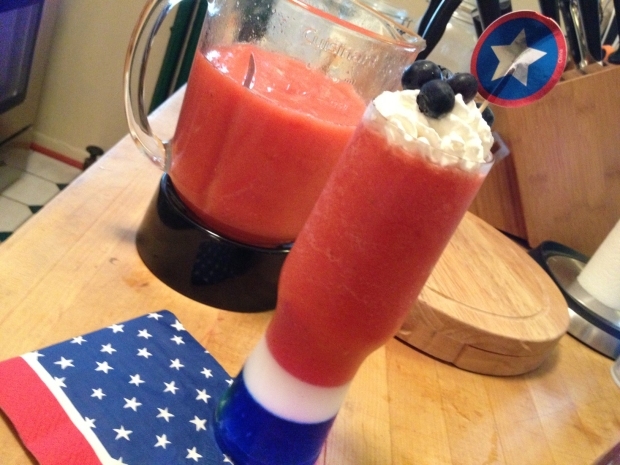 Wayne shows you how to celebrate Memorial Day with patriotic drinks. Preheat oven according to cake mix directions. Prepare cake pans with baking spray. Place both dry cake mixes in a large bowl or stand mixer. Add egg whites, water and vegetable oil, per cake mix instructions, plus one additional egg white. Mix well. Divide mixture equally into three bowls. Add 1 teaspoon of red food coloring to one bowl and 1 teaspoon of blue flood coloring to a second bowl. Mix each well (add additional coloring if you’d like a deeper color}. Pour batters into the prepared cake bans. Place on middle racks in the oven and bake for about 45-50 minutes until cakes spring back when touched on top or when a toothpick or thin wooden skewer inserted into the center comes out clean. Remove from oven and allow to cool completely. Once cooled, if any of the cakes has a high “dome” in the center, slice it off to make the cake a relatively flat topped shape. To assemble, place a little icing on a serving platter to keep the cake in place and add the blue layer. Top with a thin layer of icing. Add the white layer and top it with another thin layer of icing. Add the red layer and adjust all three so that the cake is a uniformly vertical shape. Spread a thin layer of icing over the entire cake filling any spaces between the layers. Allow this layer to dry for about an hour (if you can place it in your freezer, you’ll only need about 30 minutes). Then, add a generous second layer over the entire cake, thick enough that the colors of the cake layers don’t show through. Place about 1/3 cup of remaining icing in quart size sealable disposable bag and set aside. Place another 1/3 cup in a bowl and add about 20 drops of red food coloring and mix well (add more if the color isn’t deep enough). Place another 1/3 cup of icing in a second bowl and add 10 drops of blue icing and mix well. Transfer the blue and red colors into separate sealable bags and push the icing in all three bags to one corner. Cut off a small section of that corner, only about 1/16”, leaving a small hole (error on the side of too small initially…it’s much easier to cut a bit more if necessary). To decorate the bottom border of the cake, squeeze about a pea sized shape of white icing along the edge of the cake. Pull away to form a little peak or point on top. Skip roughly two spaces and add another. Continue around the cake until you reach the first one. Take the blue icing and place a pea sized shape to the right of every white one. Then, take the red icing and squeeze it into the remaining spaces. Repeat with the top edge of the cake. Because the liquid from extremely ripe strawberries will sometimes run down the cake, I’ll often wait to add them just before serving. When ready, slice the strawberries and place them on paper towels to soak up as much moisture as possible. Then layer them in a circular pattern about 2” away from then center of the caking forming a ring. Pile the blueberries in the center inside of the strawberry ring. Slice and serve. Optional Flavor Enhancement: If you’d like to flavor each layer of your cake, try adding 1/2 teaspoon each of strawberry, banana and blueberry extract to the batter after you’ve separated them into three bowls and added food coloring. This is an optional step because strawberry and blueberry extracts are not as easy to find in grocery stores locally. They might have to be an online order.